Behold your future go-to recipe for guests: Butternut Squash Lasagna. Not only is it totally impressive, I’d even say a real show stopper, but it can be made a day or two ahead and then just popped in the oven before your guests arrive. How easy is that! DISCLOSURE: We’ve been enjoying this recipe on repeat since early fall, and I am finally sharing the perfected recipe with you today in partnership with the Dairy Farm Families of New England. I was compensated for my time. All opinions expressed here are my own. There are times to grab those super fast get dinner on the table recipes, and then there are times, like a holiday meal, Sunday supper, or when guests are coming, to pull out a recipe like this one. You know, a recipe that takes a bit more time, but is so obviously worth every minute for the rich and complex flavors that result of time well spent. When I have company coming over, I get organized, plan ahead and I reach for recipes that I know will be a big wow moment. Friends, this Butternut Squash Lasagna is one of those recipes. 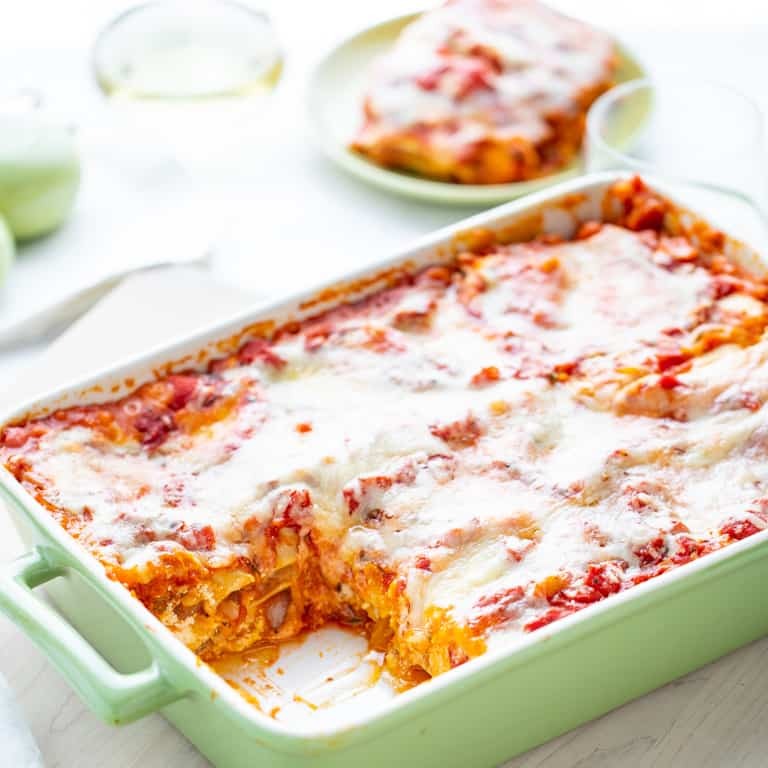 At first it looks just like a regular lasagna, but then when you slice into it, the layers of sweet creamy pureed butternut squash and caramelized onions reveal themselves and you know you are in for a special treat! The caramelized onion, sweet squash and pinch of nutmeg are such a delightful surprise. And the melted cheddar cheese really balances the sweetness and keeps the whole dish savory. No lasagna would be complete without ricotta and it adds another level of creaminess. I skipped bechamel sauce, and instead used crushed tomatoes with basil. I think the acidity from the tomatoes really works and it saved a bit of time. I’ve also made this Butternut Squash Lasagna as a meal-prep recipe: I built it on Sunday afternoon, covered it and refrigerated it. Then on Tuesday night I baked it for dinner. Bake the squash: First I cut the butternut squash in half and scooped out the seeds. I set it cut-side down on a sheet pan lined with non-stick foil. You can also use parchment. then just bake the squash until it is tender. It can take up to an hour depending on the size and age of your squash. Make Butternut Squash puree: Let the squash cool on the pan until it is cool enough to handle. Sometimes, especially if the squash cools a lot and contracts, the skin will pull right off. So easy! Then just throw the squash into the food processor with salt and nutmeg and puree it. If you don’t have a food processor, no worries, you can mash it by hand. It won’t be as silky smooth, but still quite good. You can make this squash several days in advance or you can even freeze it if you like. Caramelized Onions: At some point while you are prepping the squash, think about caramelizing the onions as well. Low and slow is the way to go when making caramelized onions. Basically you want to cook the onions until they are completely soft and then allow the sugars to darken. My stove in my studio is really hot, and so I have to have it set at medium-low and splash in some water too, to keep it from burning. Keeping the lid on helps them not darken too much too early because it traps the moisture in the pot which keeps the temperature down. Set Up Mis En Place: Next you’ll want to gather up the other components of the lasagna: the ricotta mixture and the tomato mixture. Both are super simple (just measure and stir.) I used a large can of crushed tomatoes, to which I added in freshly chopped basil (makes all the difference in flavor), salt and pepper. This is so much easier than making a tomato sauce on the stove top- and since we already have caramelized onions in the dish, the flavor will be just as good. No Boil Lasagna Noodles: Because this lasagna has so much moisture in it from an entire butternut squash, there is no need to boil the noodles. Yay! I tested this with no-boil lasagna noodles and regular noodles, and both soften just fine. Grab your lasagna dish and preheat your oven if it isn’t already. It is easy to get confused when building a lasagna so here is the big picture: you’ll have three layers of noodles and two layers of filling. Tomato and cheese goes on top- so that’s where things get confusing. 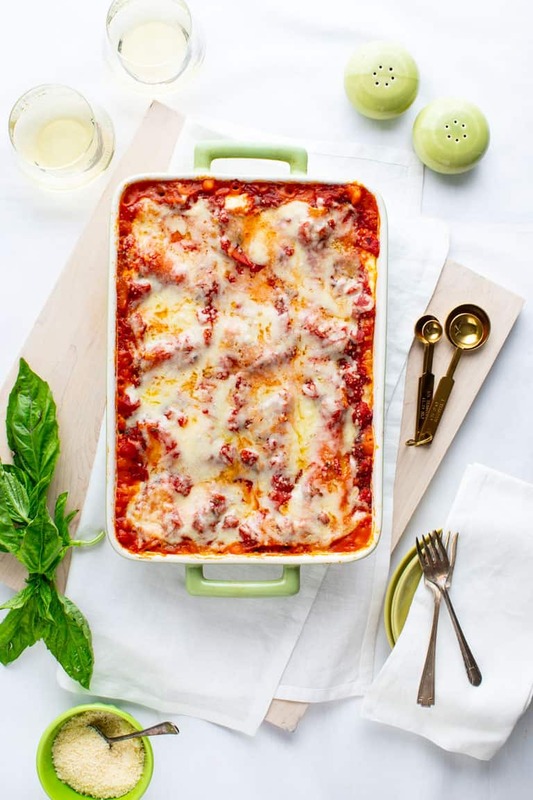 Starting with a sprayed lasagna dish, you have to keep in mind that the lasagna noodles will stick to the pan, so make sure you moisten it with about a half cup of the tomato mixture first. Spread it around to make a very thin barrier for the pasta. Then Layer in pasta layer number one. Three noodles side by side. You’ll likely have some room around each one, and that is fine. As they cook with the other ingredients they will absorb moisture and expand quite a bit. On top of the noodles add in filling layer number one. It will be half of the squash puree, half of the caramelized onions and half of the ricotta. Top that layer off with a third of the sauce and cheese. Repeat with pasta layer number two and filling layer number two. On goes sauce and cheese. Then you’ll be left with three noodles for pasta layer three. And some sauce and cheese for the top. Don’t add the cheese just yet though! After you arrange the pasta on and moisten the noodles with the sauce, cover the whole casserole dish with a layer of parchment and a layer of foil. The parchment creates a barrier between the acidic tomato sauce and the foil and will keep the foil from pitting. All that is left is baking the Butternut Squash Lasagna until it is bubbling along the edges and steaming hot. Now it’s time to remove the foil and add on the cheese! I used some grated Parmesan style cheese too, to really kick up that sharp cheesy flavor. It only needs to bake another few mintues, just to melt the cheeses. Don’t forget to let the lasagna sit for a little bit (10-20 minutes) before serving it. I always love garlic bread with lasagna- so that would be a great choice. What do you like to serve when you have company coming? Do you like to make a recipe like this for Sunday supper? Thanks so much for reading! If you make this recipe, please come back and leave a review and star rating! It means a lot to me! 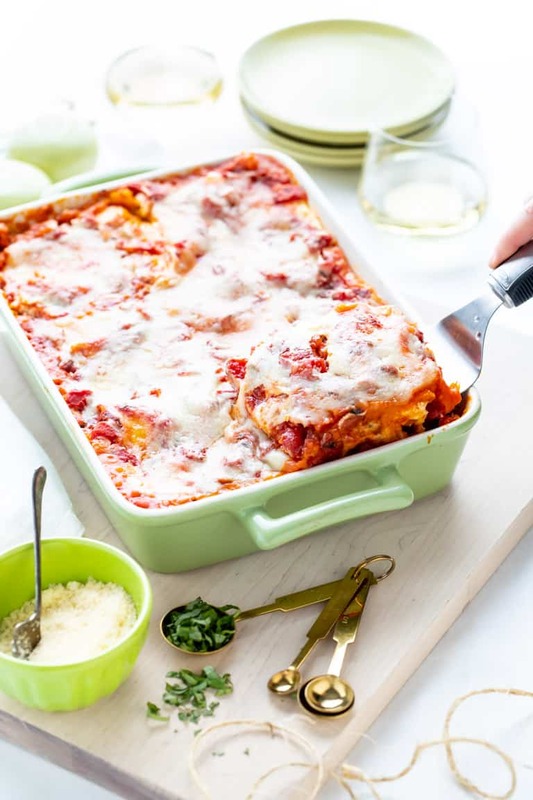 Butternut Squash Lasagna, an impressive meal for guests. Make it up to two days ahead and then just pop the lasagna in the oven before they arrive. Also a great Sunday supper recipe. Preheat oven to 400 degrees F. Line a sheet pan with parchment or foil. Cut butternut squash in half, lengthwise and scoop out seeds. Place cut-side-down on the prepared baking sheet and transfer to the oven. Roast until the flesh is tender, 45 minutes to 1 hour. When butternut squash is cool enough to handle, carefully scoop flesh into a food processor fitted with steel blade attachment. Add ½ teaspoon salt and nutmeg and process until smooth. Meanwhile, swirl oil in the bottom of a small saucepan. Add onion ¼ teaspoon salt and ¼ teaspoon pepper and set over medium-low heat. Cover and cook, stirring often until the onion is tender and golden brown, about 15 minutes. Add water to the skillet one to two tablespoons at a time if the onions start to brown before they are soft. Remove from heat and stir in thyme. Stir ricotta and egg in a medium bowl. Stir together tomatoes, basil and the remaining ½ teaspoon salt and the remaining ¼ teaspoon pepper. 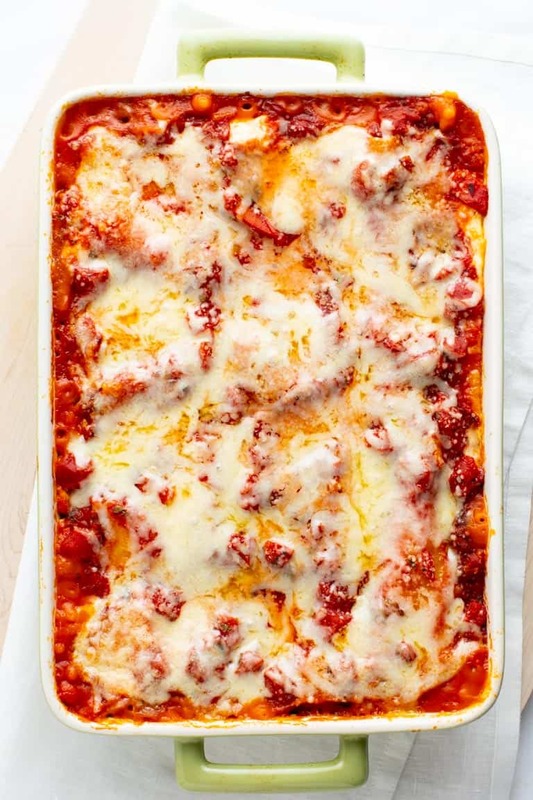 Assemble lasagna: Coat a 9×11 baking dish with cooking spray. Spread about ½ cup tomato mixture in the bottom of the baking dish. Layer on three uncooked lasagna noodles. Spread about half of the butternut squash mixture over the noodles. Top with about half of the onion. Dollop with half of the ricotta. Top with about 1 cup tomato mixture and 2/3 cup shredded cheddar. Repeat with another layer of three noodles, the remaining squash, the remaining onions, the remaining ricotta, 1 cup sauce and 2/3 cup cheddar. Top with the remaining three noodles and the remaining tomato mixture, spreading out to moisten the noodles. Cover with foil. Bake (at 400 degrees) until the lasagna is steaming hot, about 45 minutes if placed directly in the oven from prep or 60 minutes if made ahead and refrigerated. 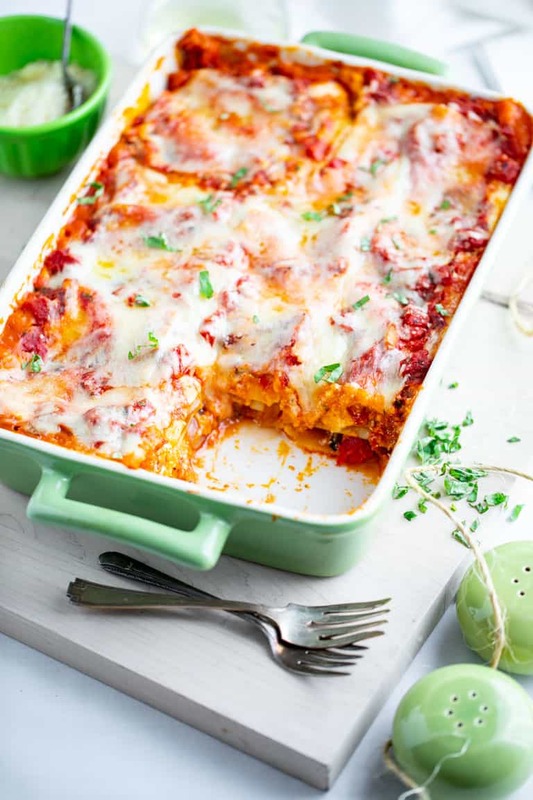 Remove foil, top with the remaining 2/3 cup cheddar and 3 tablespoons Parmesan and continue baking, uncovered, until the lasagna is bubbling and the cheese is melted, 7 to 10 minutes longer. Let sit 10 to 15 minutes before slicing and serving. Next Post Hello from N.C.